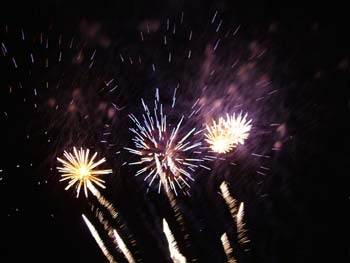 July 4 - Well, I just got a bad time from a number of people yesterday because I am not updating my site enough. Actually, I sometimes wonder if anyone really reads what I write but after yesterday, I think I will give it a shot to update more often as long as I have a wireless signal. Thanks for letting me know that you really do read the site. 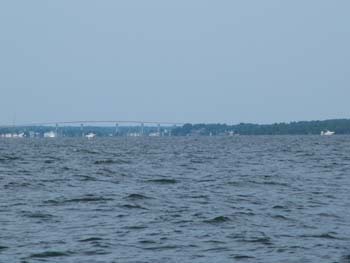 We left Solomons Island on Sunday for the trip to Crisfield. The shot to the right is one of Solomons from the Bay. We had wind enough to raise the sail and motor sail on our trip southeast. That morning we first stopped to pump out and flush (5 times) our holding tank. Then we moved to the fuel dock and filled up both tanks. 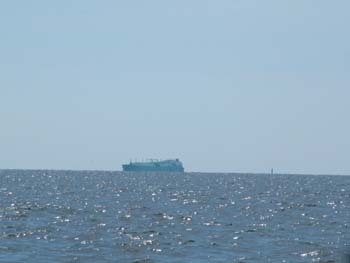 Once we were in the bay, we remembered we are in a shipping channel and you can see two of the large ships we were "interacting" with. We also passed a test facility with a ton of antennas on it. I'm sure they do quite a bit of testing up here. As we were crossing the bay we ran across an area where a school of fish were being hunted by these birds. 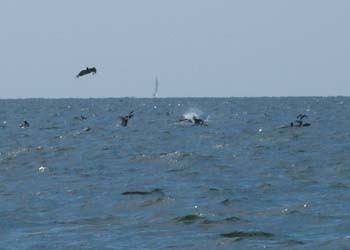 In the lower left picture, center, you can see one of the birds had come from a dive right into the fish to get his or her lunch. 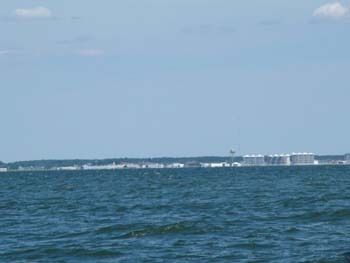 Lower right is the picture of Crisfield, MD as we approached it from the Bay. 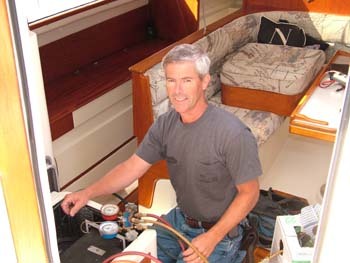 Again, we have slowed down and we have stayed too long in Solomons Island because we were promised there was a person that could charge our A/C on Saturday. Of course he didn't show so we have a lead in Crisfield we are hoping will come through. 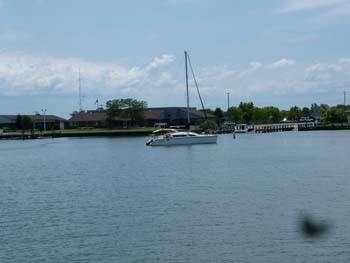 According to one of our guides, there is an anchorage within the basin at Crisfield. 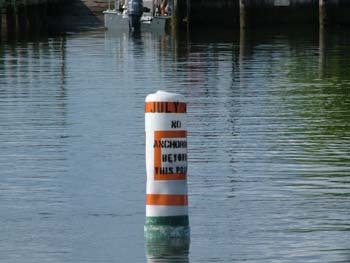 In addition, there is a dinghy dock associated with a marina that costs $10 per day to use. That didn't bother me too much but when we entered the harbor, we saw the anchorage and also noticed the public launch ramp. Since we have bikes, we decided we would use the area around the launch ramp to land our dinghy and then ride the mile around the harbor to town. It worked out great and we have been getting in some good bike rides each day. I do enjoy riding the bikes and the exercise we get from it. On the first day, we took a tour of the town and began to notice a number of things. First, the town is in serious decline. At first, I didn't understand why, however we learned the crabbing was bad last year and this year looks to be even worse. When a town has built itself around one industry and the raw materials, crabs, become a problem then the entire town has a problem. It is really too bad because I then began talking to the people we met and they are having a very hard time of it making ends meet. It ends up many are living on unemployment although they would rather work. They all know this is serious and are hoping and praying next year pulls them out. 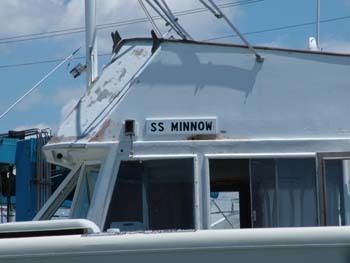 We also found out this must be home for the Skipper and Gilligan. It looked like their boat was in the yard for repair. I didn't see them or any of the other cast of characters but I'm sure they were around somewhere. Since we were in the crab capital of the world, we just had to do some crabbing on our boat. To do this, you take a string that has a weight and stainless steel device on it designed to put your bait on it. In our case, we used chicken necks. We threw out 4 lines and then waited for 5 minutes. Next you pull the line in VERY slowly and if you have a crab on, it will hold on until it gets almost to the top of the water. 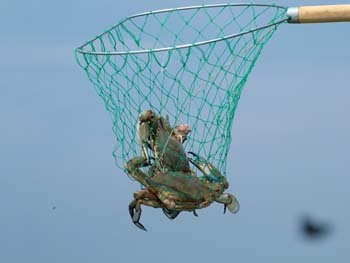 Then it will drop off, so you have to have a net with a long handle so you can scoop them up before they drop off. We caught 8-9 of the but only kept 6 that were large enough. These were still pretty small but that is because they will grow over the summer. Evidently they will shed their shell and each time they will get 1/3 larger before they have to shed their shell again. 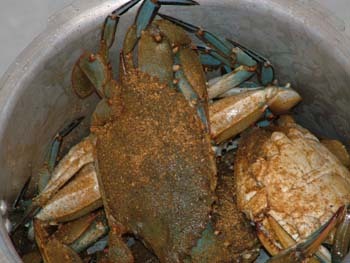 When we come back in August the crabs should be big enough to be worth the effort of cleaning and eating them. 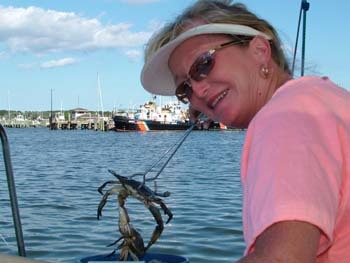 Deb is having a great time crabbing, and I mean the fishing kind. She does the pulling of the line and it is my job to actually net them. You can see a couple of them we caught that she is lifting with the tongs. Of course it is one thing to catch them, now we have to cook and eat them and that isn't something we've ever done before. 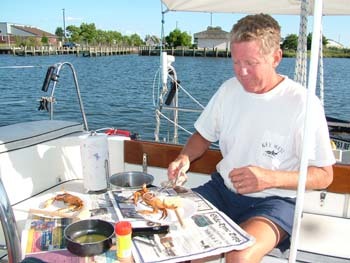 We placed a couple of calls to Bill and Christy aboard s/v Veranda as we were catching the crabs. When we had enough that we knew we would cook them, Christy told me to boil or steam them. I decided that I would use my pressure cooker to steam them and of course they had to have Old Bay Seasoning on them. After we got the crabs into the pot, and they kept trying to crawl out, I put on the top and turned on the burner. After I built the pressure, I cooked them 8 minutes and that seemed to be about right. Below left you can see they turned orange which was what we were told they should do. Next it came eating time. You separate the top and bottom shells and then pick out the things you don't want to eat. It really is pretty easy because you can quickly figure out their "lungs" and the other parts that make up their intestines. We got rid of that and then picked out the crab meat from the main body. Then came the fun part of using the little wooden hammer to gently break the claws so you could get to that meat too. Overall, these 6 were barely an appetizer. 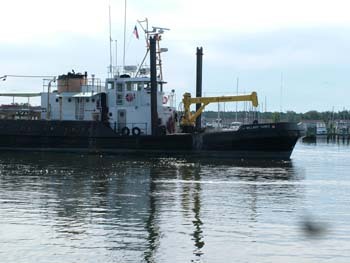 The next morning, the 2nd, I got up and this Coast Guard ship was working around our anchored boat dropping in some buoys. I got out the binoculars and found out they were putting in an anchoring restriction for July 4th. After getting on the radio to find out if I was going to be ok anchored where I was, he called back and said he would take care of me. He then maneuvered his boat around mine and put it between us and the boat ramp. It ended up being perfect for us and we didn't have to move. Remember the A/C? Here is an unqualified recommendation for AM PM Heating and Cooling. We got connected up with Steve and he came out to our boat. It ends up he has a boat in the harbor too. Steve was great and quickly went over the symptoms with me and concurred it was probably low on charge. After connecting his gauges, he found it was low. So he charged the unit and it works great now. If you are ever in the Chesapeake and need to have your A/C worked on, think about running over to Crisfield and calling these folks at 410-968-2705. Not only did they fix it by showing up on time, the charge was fair too. I couldn't have asked any more. Thanks Steve. We skipped Smith Island to get over to Crisfield in hopes of fixing the A/C. It ended up this is where they provision the islands from and there are tours which leave from here everyday. We took off on Tuesday afternoon on a tour. At least we would know if we missed anything. 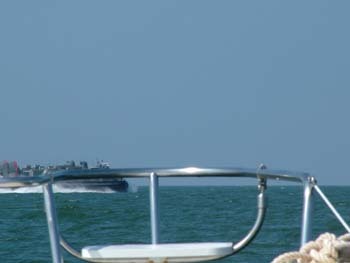 We bought our tickets, loaded our bikes on the boat and on the way out, we passed our boat anchored off to the port side. 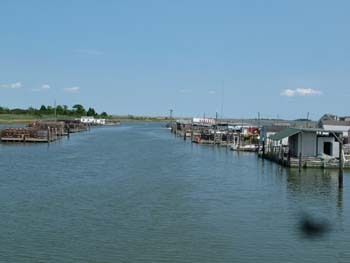 As we left Crisfield, we saw the old crab processing location. 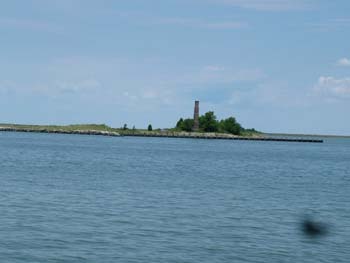 The chimney you see was rebuilt and is now a park accessible only by boat. 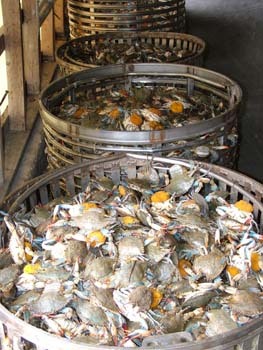 This is where they previously processed the crabs. 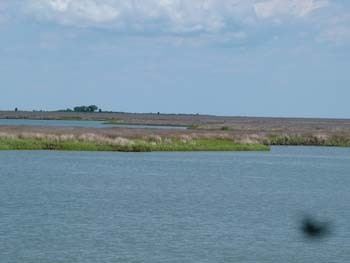 As you make your way into the channel going into Smith Island, it is clear there are a number of marsh lands in the area. We ultimately found out the bugs are there too. To the left you can see the channel that took us into Smith from the southern entrance. After a quick lunch of one of the best crab cakes I've eaten, we went back and picked up our bikes. The town is small and I shouldn't have been surprised about the state of disrepair the town homes were in. Again, this is the second year of a bad crab catch so this is a real town killer in this small town. I took the picture to the lower left because I couldn't hardly believe this was the motel. It looked like a 5 room ranch house. I also had a hard time believing that there was so much junk sitting around the yards. Something that doesn't cost anything to fix. I guess that is just me. Upper you can see that they "pack" in the people in the town cemetery. Even though the tour was only 3 1/2 hours for the town, we had an extra hour or so since we were riding bikes. We decided to walk into the cemetery. 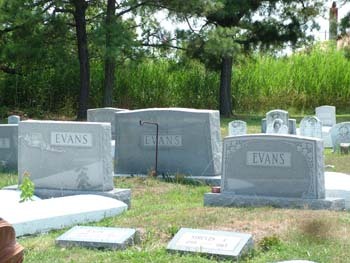 What we found was almost half of the tombstones had the last name of Evans. 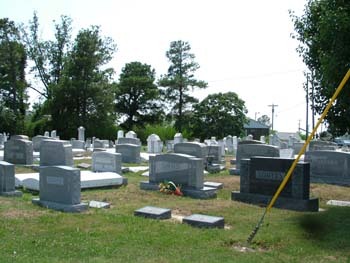 The picture to the right shows the closest cluster of Evans tombstones we could find. There were many such clusters throughout the cemetery. 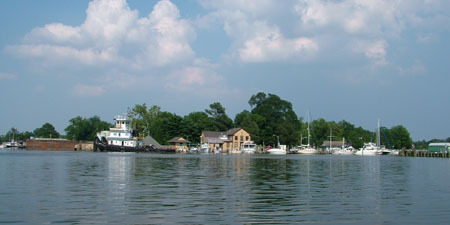 Lower left, you can see some of the buildings along the waterfront. These were used to hold crabs after they were caught. They would keep sea water running through the boxes and at night they would turn on the lights. The purpose of the lights is to simulate a full moon. 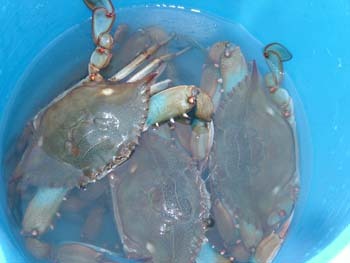 It ends up that the crabs loose their shells on a full moon and this is where a "soft shell crab" comes from. It must be that a soft shell gets more money at the market than a standard blue shell crab will thus rewarding you for the extra effort. Lower right shows you some of the dockage in the area. As we left, I took these pictures of the channel, docks and boats. Again, what was interesting to me was the fact that so much was in disrepair. I hope the crabs come back next year both for the island and so we continue to have a good source for crabs. Who knows if it is because of the cool spring as one of the ladies on the island told me or if it is something else causing the poor crab production. We had a quick trip back and I was able to sit next to the guy that owns the tour operation, restaurant on Smith Island, a motel and restaurant in Crisfield along with another piece of waterfront he is planning on converting into a crab restaurant in Crisfield. He must have 5 million worth of assets and I started talking to him about being an entrepreneur. 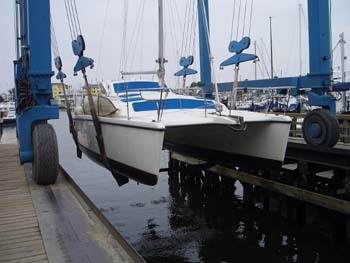 I had it figured out what it cost for the boat to run and some other expenses within about 50 bucks a trip. He then told me some more about his plans and we had a great talk on the way back. I suggested to him a movie about the island and by the end of our trip back, he assured me he was going to take the idea and make it happen to enhance the lunch experience on the island. I always have fun trying to create ways to enhance a business. Hopefully he makes even more money on his business. By the way, he is 72 years old and still loves to go to work every day because he doesn't know what else he would do with himself. As I'm writing this, it is the 4th and we've already been to town to pick up a few supplies from the outdoor vegetable market. Of course we went to lunch but then had to ride back into the wind in 20 knot winds. Good exercise. 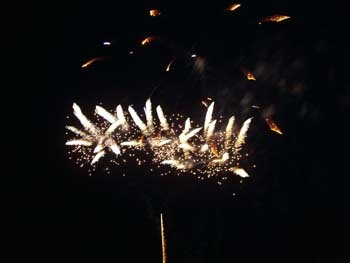 Tonight is the "big" fireworks show and we should be able to see it from our boat and we are really looking forward to the show. Perhaps we can get a couple of pictures of the show. We will still be in Crisfield tomorrow because the winds are coming from the direction we want to go and we have to pick up our box from the post office which should be there so I can mail the camera back and get it fixed. 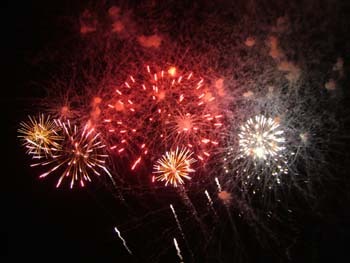 Take care and have a great Fourth of July. July 6 - We decided that we would crab again on July 4th awaiting the fireworks. We started out pretty lucky catching two at a time the first chicken neck we pulled up. However, we only caught one more crab so these guys went back to Davy Jones' Locker. 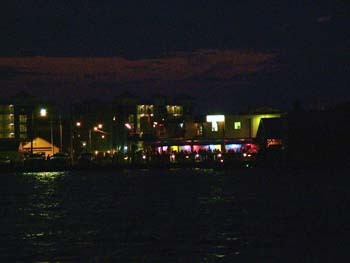 The shot below is the one of the bank that we are looking at as we at dark awaiting the fireworks. However, the wind has now come up and is getting stronger. As a matter of fact we are up to about 25 knots and that ended up meaning that the fireworks were canceled. I guess it was a safety problem. We figured that they would be the next night. 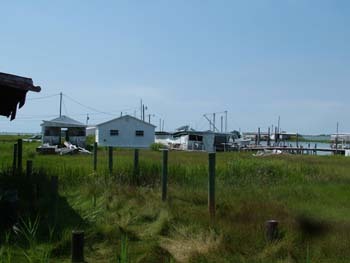 The next day, the 5th, we decided to take the walking tour of Crisfield. It was well worth the $3 per person. We learned about the town, the new strategic plan they are creating and history. 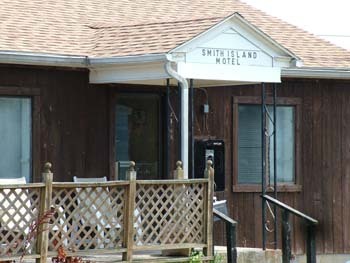 For example, I'll bet you didn't know that in the town incorporation papers that the first ship you see to the lower right is at the location designated for the Smith Island Mail boat. 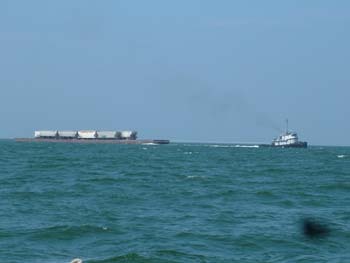 The second ship is for the Tangier Island ship even though it is in Virginia they do the mail from Maryland. 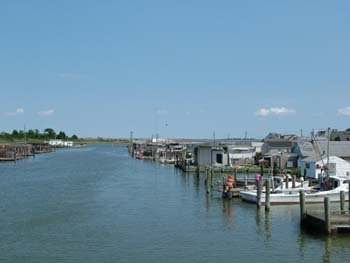 On the tour of the town, we saw how they process crabs and I went back while Deb was doing laundry to pick up some freshly picked lump crab. 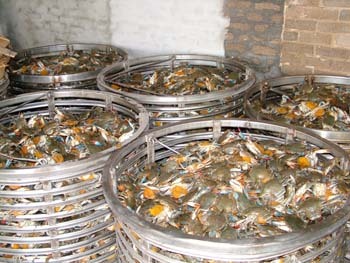 I took the pictures, as if you didn't know who took them, of the live crabs waiting to be processed. You can see there are thousands of them awaiting the steaming process. 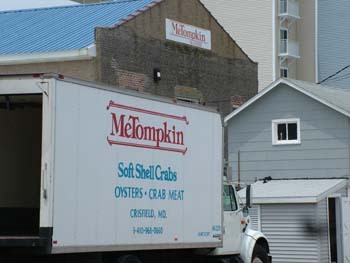 MeTompkin has been in business for over a hundred years and they guy I purchased the lump crab from has been there since he returned from WWII. He loved crabs and loved his job. As Deb was finishing up the laundry, I also picked up the mail and yes we did get the box to mail my camera back. I am thinking that we won't mail it off for another week. Otherwise, I will probably get in trouble because I won't have pictures on the website. Ok, I'm giving some of you a bad time but thanks again for reading the site. I'm planning on picking up a cheap digital to be able to take some pictures while my good camera is getting fixed. Well, at 9 p.m. on the 5th the sky's lit up. Now I have to tell you that we anchored where we did because I thought it would be protected. 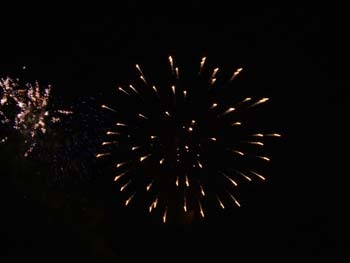 I also thought the fireworks would be about a half mile away over the bay. I was wrong! 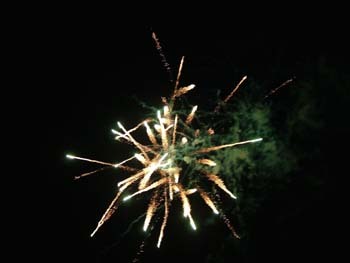 It ended up that the fireworks were set off about 100 yards from our boat. 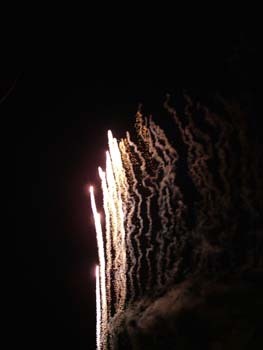 We were in the number one premo spot if you like fireworks. 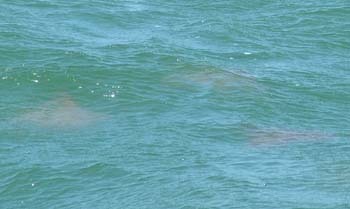 The blasts were going off about 50 yards from our boat and above our heads. I was also happy because the splotch on my picture didn't show up. 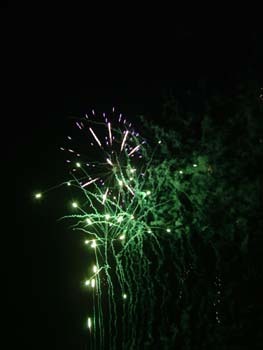 Overall, it was a good fireworks show and I've never been so close to the multiple explosions. Of course there was this one time with a friend named John Gerwitz along with another Priest friend when we were setting off a couple of these. I have to tell you I was the guy holding the flashlight so they could run away on the banks of Kentucky Lake. That is another story and I don't think I will mention other names at this time. We have had a great time in Crisfield and it appears it is on the rebound since we've learned more about it. We may stop again on our way back down after Annapolis. We are now off to Onancock, VA for our next adventure. 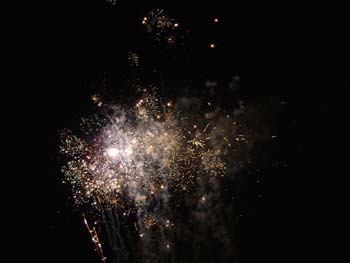 Everyone has a grand finale and this is the one at Crisfield. It was a good show and we were in the number one premo space. 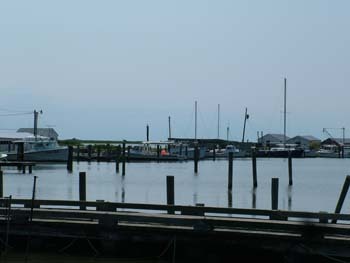 July 8 - We left Crisfield on Friday morning after hauling water out to our boat. We felt like we had a good stay and were ready to move on. 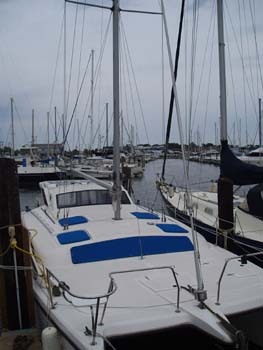 We motored into a wind out into the Chesapeake and I put up the main sail just before we turned south. We were able to sail about half of the trip to Onancock, VA before the winds died down. Since speed isn't an issue for us right now, I stayed with the sailing until we were only moving about 3.5 knots and then started the motor again. I really do enjoy it when we are sailing without the noise and using the same energy our forefathers did when they explored this bay in the late 1500's. Overall, we were able to sail for about 3 hours. It is interesting that it doesn't matter where or when we are going someplace that the wind seems to come from that direction. 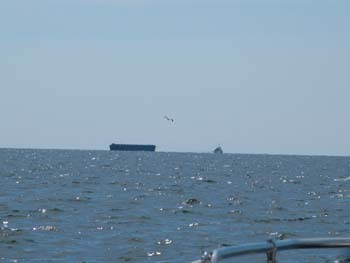 To the left is a picture of Tangier Island which we passed on the starboard side. 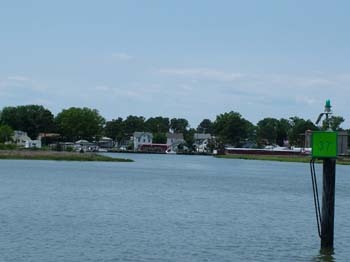 We made our way up the channel of Onancock Creek for the 4 miles to Onancock, VA. To the right you can see the picture as we approached the town. To the left is the gravel loading company, followed by a nice restaurant, the town wharf which does have places for you to tie up if you would like and then to the far right just before the bridge is the dinghy dock. 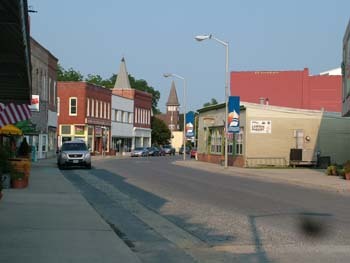 After you walk up the "hill" on the main street to town you encounter the old town area which you see to the lower left. 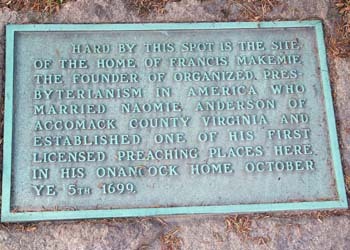 Onancock seems to have found it's new niche and the town is not in decay as was Crisfield. There are a number of restaurants and shops which range from a small bakery, gourmet kitchen utensils, and a neat hardware store that also has fresh vegetables. However, there isn't a grocery store in the old part of town. The grocery and other strip mall type of shops are 3 miles to the east at highway 13. I made the bike ride but it would be quite a long walk if you don't have bikes. We also found a theater in the "old" town which must have been built 50-60 years ago. Since we hadn't stayed up past 9 pm in awhile, we decided to stay on the boat for most of Saturday and then head in for dinner and a movie. We had a great time and this is the first theater I've been to in my life that the popcorn and soda's weren't overpriced. When we finished we also found a couple of ladies singing across the street in one of the restaurants so we did make it a "late" night. When I got up on Saturday morning, I took the picture you see to the lower right. I've seen these pictures in the cruising guides but I thought it was a really neat effect with the reflection being so clear since there wasn't a wind. As we were walking up the "hill" we noticed the plaque you see to the left laid into stone and concrete on the ground. It is interesting to me that we were standing in the place where the home for the founder of organized Presbyterianism was located. I try to imagine what it must have been like when people were coming to America in the 15 and 1600's to get a new start. Perhaps they were running from something or perhaps they were being persecuted because of their religion. Regardless, they made a decision to leave their country and come to a place which could be very hostile. 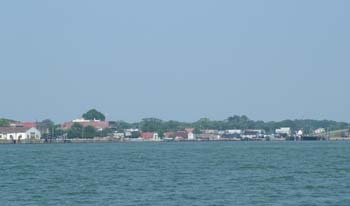 When the earliest settlers arrived in this area, they found two vastly different sides of the bay. The western shore was populated with many more "warring" tribes of indians than the eastern shore. Of course the western shore had many more opportunities and natural resources. I guess some things don't change. 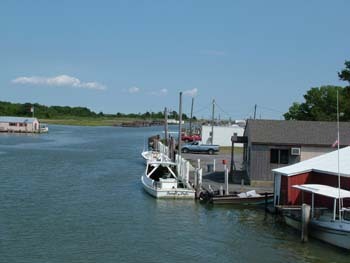 As we explore the western shore, they have substituted warring indian tribes with the large cities where everyone is clawing their way to the "top" while the eastern shore has many small towns where everyone seems to simply enjoy their lives. Of course, they may also be clawing but so far we've found the eastern shore is quite a bit more laid back than the western shore. Today, Sunday, we are planning on another day on the boat along with more guitar practice. It ends up that Mike, my friend who sang in the band, has put in a request for me to learn 4 new songs plus remember the old ones we previously played. He has a party set up for the evening we get back to St. Louis and we will be playing as soon as we arrive. Of course we won't have time to practice together but who cares, we will have fun and I'm sure it will be entertaining. 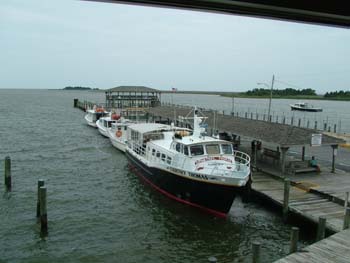 Next stop, Cape Charles, VA.
July 8 - Afternoon - We went to use the "fixed" A/C and it broke again. Great... It was going out on high pressure overload even though we just had it charged and all was working well including the check of the flow of raw water back in Crisfield. Still, I began with my basic checks such as is water going through the system to cool it. First check and first problem. No water was going through the system. Ok, maybe we picked something up in the raw water strainer. Nope, the problem ended up being the raw water pump motor has failed. It won't start. I took the pump apart and the shaft is free but the motor won't start. Great... We are on the lovely eastern shore in a very small town and the chances of them having a pump are next to none. I soon found out I was over estimating the chances. I don't know about you but when it is 95 inside a boat, that seems pretty hot. So, being the good little McGiver student I am, I decided there had to be something I could do. I went to the hardware store and they opened for 3 hours on Sunday afternoon. After checking on a pump which they nor anyone else had, I also asked about sump pumps. I ruled that out because I would have to have a hose going through the door to make that work along with the purchase of another water hose. I ended up choosing to use a washdown pump that I used for outside showers. The problem was I needed some hose fittings and the hardware store had a couple. After rigging things up, I connected the pump and found it had a flow through the system equal or better than the other pump. Good news. Started the A/C on the generator and what happened was a transformation in Deb. Cool Boat = Happy Deb She is now calling me McGiver. I guess all those spare parts and hoses I have on board have a purpose after all. It is really cool sitting here writing this too. Now all I have to do is find the right replacement pump so I can get rid of the mess on the floor in the starboard berth. Such is the life of a cruising sailor, you have to love it. Of course I now have a picture. The pump to the left is the one I now have in the system and the one to the right is the one I have to find. Hopefully I'll get it in Norfolk. When using it today, I had to clean out some jelly fish from the strainer when it got clogged. So goes life. July 11 - We continue on our Eastern Shore tour. 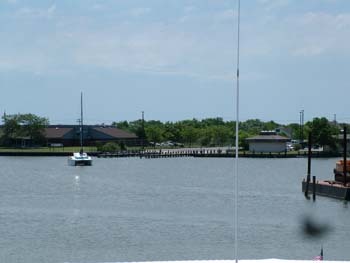 We arrived in Cape Charles a few days ago and to the right you see the main harbor that we passed. This is the harbor the ferry boats previously came into before the bridge and tunnel was built. In addition, there was a large railroad yard here as well. The train ran from New York to here and brought goods along with people to the town. After we decided that anchoring out may be a problem with such high heat, we decided that we would go ahead and go into a marina. Neither Deb or I could remember when we had been in a marina last but decided that given the heat, we would succumb to the temptation and go in to a marina with a pool and close to the town. As we rode our bikes to town, we then found a wonderful museum. It wasn't huge but it was very unique and it was hosted by a wonder lady by the name of Mary. Mary, pictured to the left, is the wonderful lady who met us at the entrance of the museum. 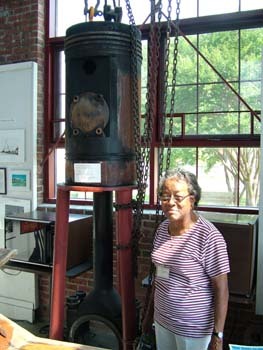 She is pictured next to a piston and connecting rod from one of the diesel engines taken out of the old power plant for the town. 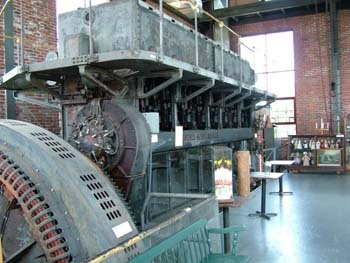 The old power plant was converted into a museum by those committed to maintaining the town's history. 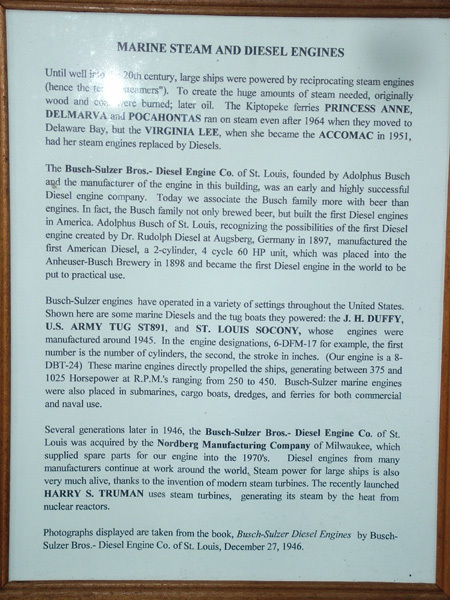 I was looking at the very large diesel engine and found it was a great display of not only history but how an engine worked. Someone had taken the time to remove the panels and install plexiglas panels so you could see the rods and working components of the engine. On top of that, they had installed an oil pump so that the engine could be run in demonstration mode with oil pumping through the system so as not to damage the engine. When I asked Mary if she could turn it on, she said sure. It ends up her husband was a mechanic and she had worked here for 3 years. She powered up the oil pump and then checked the oil pressure to ensure she wouldn't damage anything. Finally she turned on the electric motor with a gear reduction on it so that it would turn the giant diesel engine. 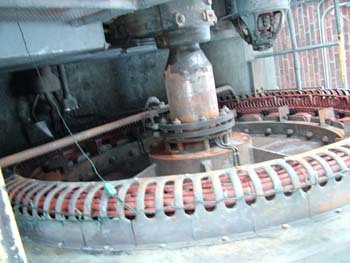 Below you can see the large ring that was turned by the engine to create the 120v power for the town. It ends up they had two of these motor generator systems in the building but one was removed to make room for the rest of the museum. It wasn't until it was running that we noticed the name Bush on the side. If you continue to scan down, you can see a picture of the name on the side of the motor generator and it contains the name of Bush. 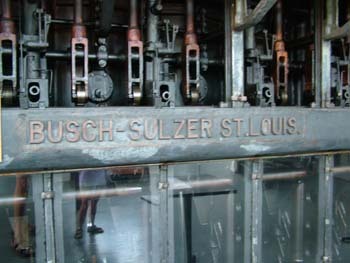 It ends up that Aldolphus Bush of St. Louis saw the diesel in Germany and brought it to America. He helped start up the company that built this engine not to mention that little beer company still headquartered in St. Louis. I took a picture of the plaque that explains all of it and hopefully you can read it. I hope our old friends in St. Louis will get a kick out of this too. As I mentioned, this engine actually turns and you may be able to see from the picture to the left that the rods are shinny. 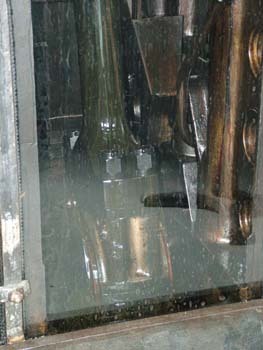 This is because of the oil that is being pushed through the journals of the engine and then running down the rods. 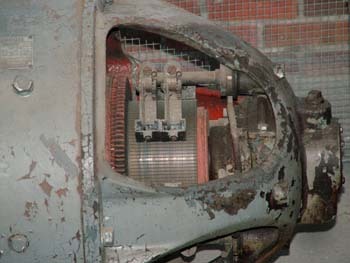 I had some fun looking at the electric motor and gear reduction unit that has a gear made to match the ring on the generator. Without compression, it was clear they had sized the unit correctly so you could see the engine running through it's paces. 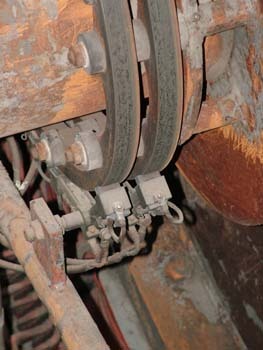 Below are two pictures showing the brushes which transfer the power from the commutator rings out to the town. I have to go back a few days in our trip. We went into Onancock to get a pump out before we left. It was 8 am and on the bench outside the Onancock Wharf were two men sitting. On any day, I might have simply passed them up. However, on this day we made conversation as we docked and located the harbormaster so we could get pumped out. As the conversation went from what we were doing, always an amazement to people, to who they were, one of them told me of the days he used to run a passenger ferry from Norfolk to Cape Charles. When they build the bay bridge and tunnel, they then moved the ferry boats north. At the time it didn't mean much to me. However, at the Cape Charles Museum I found out that this was a BIG deal. 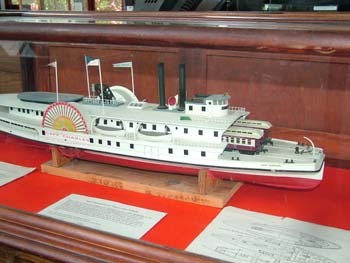 He was the Captain of a ferry that took passengers, cars and other materials across the Chesapeake before the bridge was built. In our cruise, we have encountered many people of whom we have had great conversations. I wonder how many people on benches we have passed who had wonderful stories and contributions of their own. It really makes me consider my own prejudices and stereotypes as we continue this cruise. 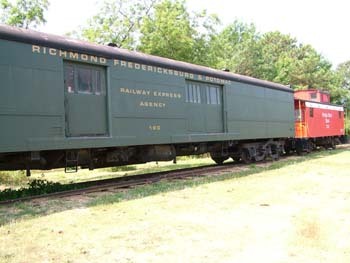 Behind the museum were these two railroad cars which were donated. In addition, they also had a railway station which had been restored as well. The eastern shore cruise has proved to be a great experience because we have been able to interact with a number of people who have loved their towns. However, as we were riding our bikes today we were also brought back to the reality that life can carry with it the possibility of accident. We turned down a street and saw police cars with several people outside. I quickly figured out from the paint spilled on the wall and porch roof coupled with the man laying with his head on the steps, supported by a lady, while his ladder was on the ground where if fell after he fell off of the roof. This was an accident scene that could have been prevented. Unfortunately, he didn't tie his ladder to the wall while on the porch roof. I hope he made it because it took several minutes for the ambulance to show up. I'm sure he had a serious concussion and most likely a broken skull. Fortunately the police were on the scene and, as we learned later, one was trained as a paramedic. I'm sure he painted like this on a porch roof many times with no incident. However, this time it was different for whatever be the reason. I think we will ensure we use our jacklines and clip in when we leave the cockpit, even in the daytime, when we are offshore rather than just at night. 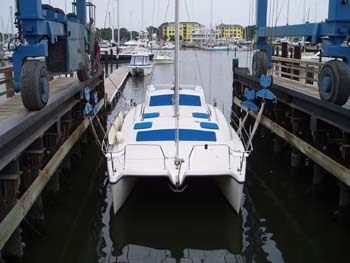 July 12 - We left yesterday morning for Norfolk and Cobb's Marina. The forecast was for 10-15 knot winds and seas less than 2 feet. Guess what? Once again, they were wrong. Of course the wind was coming from the direction we were going but I expected that. 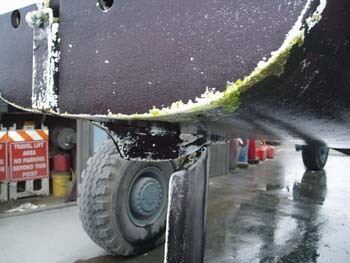 I didn't expect the 22 knot winds and 3 foot seas which we were taking over the bow (front) of the boat. Fortunately, they weren't coming all the way over the boat. 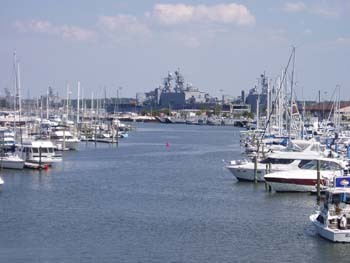 The problem is that in the Chesapeake, like many of the sounds we have gone through, it isn't deep enough nor big enough for the waves to build and spread apart. In our case there were two waves about every 20 feet. Therefore, we would sometimes hit them with the bow up and other times with the bow down which caused us to have water everywhere. Let's just say it was a rough ride and we did it for about 5 hours. The good news was that it is supposed to be worse tomorrow and the following day so today was the day to go. 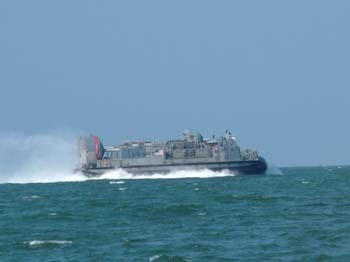 I saw this hovercraft coming up on my port (left) side and saw that he was easily going to pass in front of me. I knew from the minute I saw it that it was a hovercraft from all of the spray that was going everywhere. You can see above that we were fairly close and to the left you can see the spray that is coming from the rear of the fans that are pushing the ship. I'm absolutely positive they had a better ride than we were and we were paying for a portion of their ride as well. For one of the first times, Deb felt a bit queasy and took a nap after getting beat up so much. Of course I'm sure you are wondering how I was doing. I did great and didn't have a bit of sea sickness. As I look at the pictures, I wonder where the waves are but you have to believe me that at one point we are pointing up about 30 degrees and the next we are pointed down about 20 degrees. Believe me the only one having fun out there was Mother Nature and she was laughing at us. 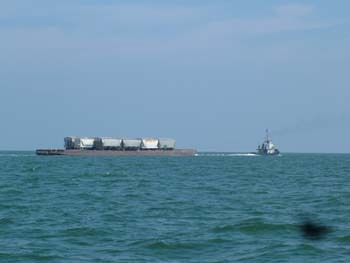 Below yo can see a unique barge being pulled by a tow that is loaded with railroad cars. I guess they wanted to get rusty and take a ride in the Chesapeake. You have to forgive the pictures. These were the best I was able to take and I took a bunch. 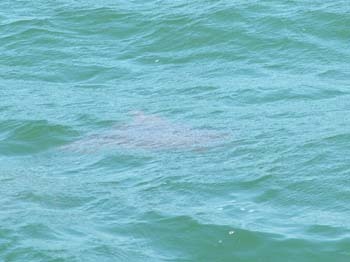 We passed, and I'm not exaggerating, thousands of rays in the water. you have to look for the brown spots in the water and you can kind of see them. It was amazing. They were everywhere. Big ones and small ones. Everywhere and I couldn't see that far in my little boat. I started seeing a few of them and all of a sudden they were everywhere and I called to Deb to come up and see this impressive sight. She and I held on to a rail and stood on the bench seat so we could get a better view without being thrown out of the boat. It was truly amazing. 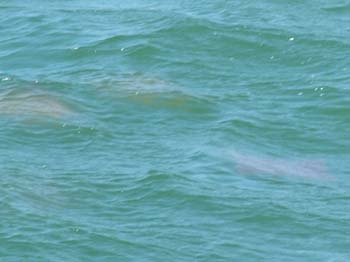 I guess they were coming into the Chesapeake to spawn or to have the babies after they have already spawned. 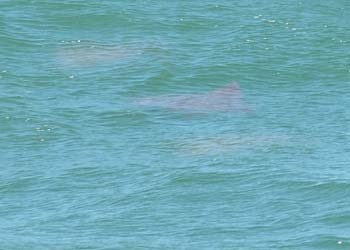 I don't know but I am certain the Chesapeake is now full of rays and I'm betting I didn't see them all. As a matter of fact, I'll bet I didn't even see a small portion of them. We made it to Cobb's Marina and they had a slip for us. Unfortunately, it is about 14' 2" and we are 14'. Regardless, we are here and safely tied to the dock. In addition, they had our new A/C pump waiting on us as requested. 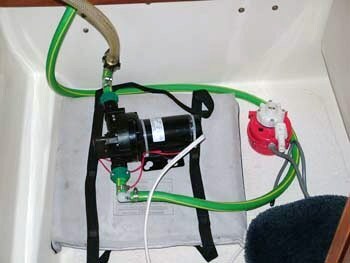 I installed it last night after we got the boat cooled down. We are scheduled to haul out at about 1 pm on Friday so we have found a "cheap" hotel for Friday night with a shuttle to the airport. This will be the first time we have not stayed on the boat in 3/4 of a year. As much as we are looking forward to seeing family and friends, we are also going to miss our bird, Jimmy Buffett and living on the boat. 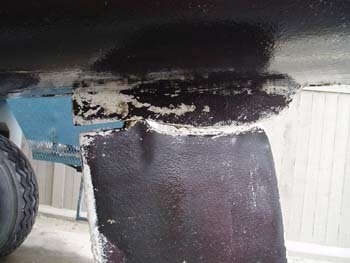 The good news here is that I will be there for the hauling of our boat so that means I can see if there are other issues with our bottom and ensure it is blocked properly to dry before the new paint is applied. Interlux has been wonderful in honoring their commitments and the paint will be here next week for the yard to work into their schedule in about 3 weeks after the hull dries a bit. We are scheduled to splash again on August 17th before we fly back in to Norfolk. July 13 - Friday the 13th and we are spending the first night off of our boat since the first of October but I'm getting ahead of myself. 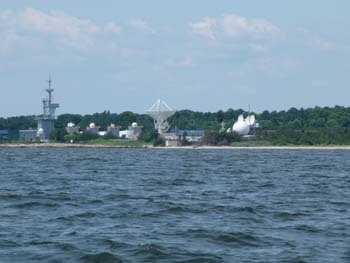 We arrived at Cobb's after passing the naval base you see in the distance. 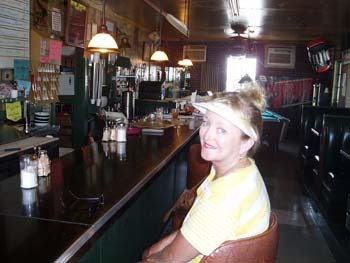 We found a great place to eat and a very reasonable price across the creek where we were staying. We offloaded the bikes and took a ride. You might notice that we don't have the black splotch in the right hand side of our pictures anymore. We stopped at a couple of stores and finally at a Pawn Shop. After a bit of negotiation, I bought another camera, an Olympus, for $75. Everything works so we sent our other one off to be repaired under warranty. We lucked out and had 3 weeks left in the 3 year warranty. Lower left you can see Deb was happy. I think that was because she had returned from Peggy Cobb's house and found that not only does Peggy raise birds, she had over 50 of them. Our bird, Jimmy Buffett, will be in good hands. Lower right you can see that we are taking everything as we fly back to impose on our friends and family. I'm sure they can't wait! Don't you just love those bags we picked up at the thrift store? 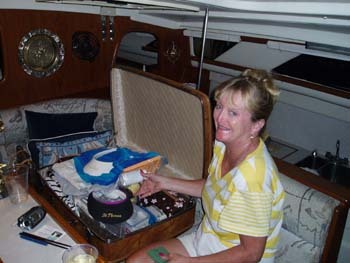 Since we are leaving the boat for 5 weeks, we were a little worried about the possibility of hurricanes. I decided that we would take everything off of the outside of the boat. 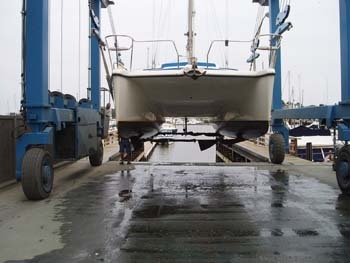 After stripping the sails, and everything else we could to secure the boat before we left, we were ready for hauling the boat. The pictures below show us coming into the lift and the boat as it came up. We've done this several times before but this time was different. 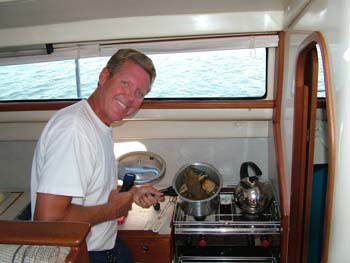 We were leaving our home and heading out on a 5 week hiatus on land. I sure hope we don't get that land sickness they describe in Waterworld. 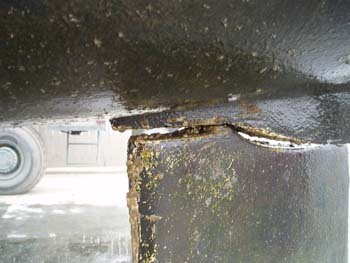 When the boat came out of the water, I quickly took a look around. It didn't appear we had a single blister or any other problems from the work we did last summer. The Interlux 2000 was working and it certainly appeared the only thing that wasn't was the bottom paint. 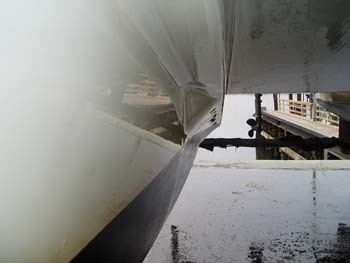 Below you can see some pictures of where the bottom paint didn't work and some barnacles that resulted from the fact that I didn't clean it for the last month with all the jelly fish in the water. 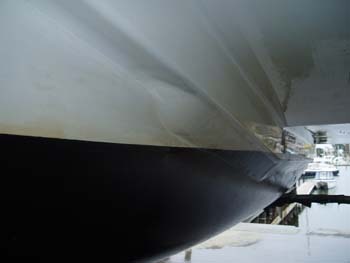 And some more on the other rudder. The pictures at the bottom show the modification I made to the hull to make it even quieter than it was. I added a slope between the hull and the flat surface which was coming down to the water. 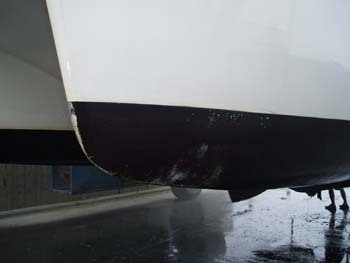 I have been very pleased with the result and it makes the boat quieter underway and at anchor. I am also pleased that it is holding up so well. Isn't it great when a plan comes together. Just before we were leaving, I was watching as they were blocking the boat. It should be fine for the next 5 weeks and if a storm comes then it will be as safe as it can be since it is 10-12 feet above sea level. 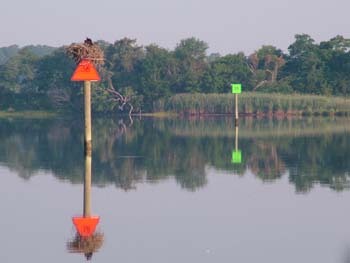 For those who are just interested in sailing, please plan on revisiting the site middle of August. However, if you are interested in what we are up to, we will continue the updates as we can. Next stop, Omaha, NE.